Flowers add color wherever they are placed – our gardens and even to the interior of our homes. The natural beauty given by flowers is certainly incomparable! They grow with love and has the aura to spread that love all around. It looks lovely when placed on a vase or on a jar, but it looks even more beautiful when left on the soil as it continues to bloom with beauty and vibrance. 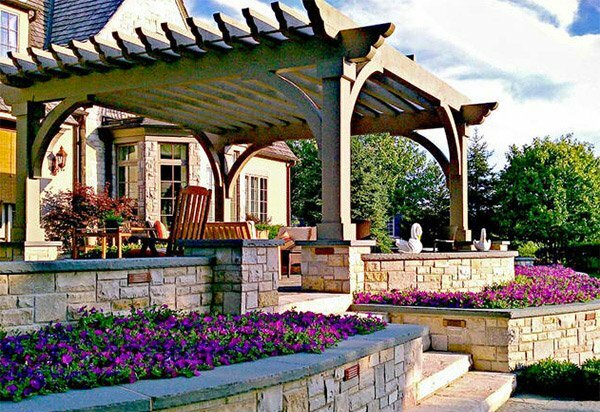 Today, we will show landscaping ideas for flower beds in your very own garden or yard. We have gathered some pictures showing what they did with their outdoor space using flower beds. 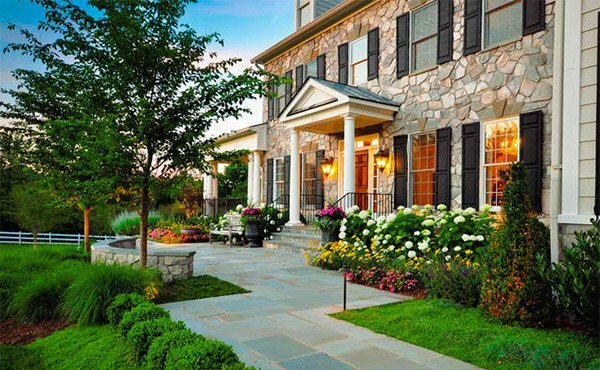 It is amazing how flowers could improve the way a house looks as it seemingly adorns its exterior. Take a look at what we have collated for you today. Who will not love the pom pom flowers in front of the window of this home? 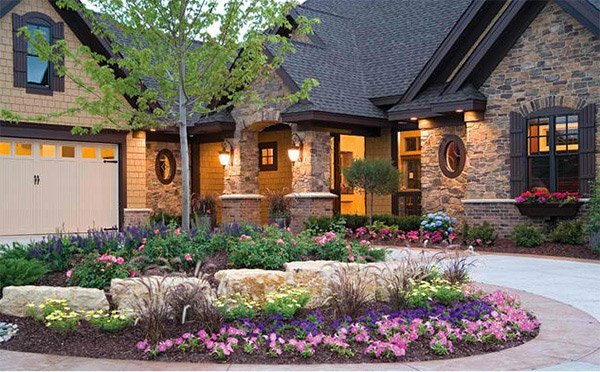 The colors of the flowers are very gorgeous and they match well with the stone walls of the exterior. 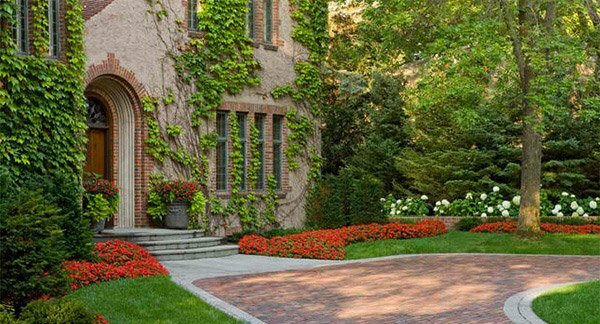 This stately home features plants with seasonal color while retaining is classic look. Aside from the cute colors from the flower beds, the vines on the walls make it look like a castle from long time ago! This outdoor gathering area with a poolside fireplace and bar is adorned by a stone planter with some flowers on it. Flower beds surround the pool area too giving it a pretty touch of nature. Isn’t this a lovely combination of flowers? 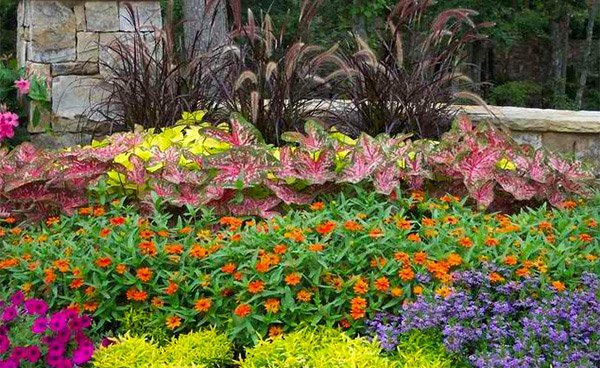 The purple look like they could be Scaevola, the light green tuffs are Joseph’s Coat, Petunias are in the bottom far left while the middle row are Zinnias, the red and green elephant ear plants are Caladiums. The flowering bushes in the front are Hydrangea macrophylla in strong pink color accents. Lavender Wave Petunias titivate the stairs that lead to a courtyard. Aren’t they sweet? 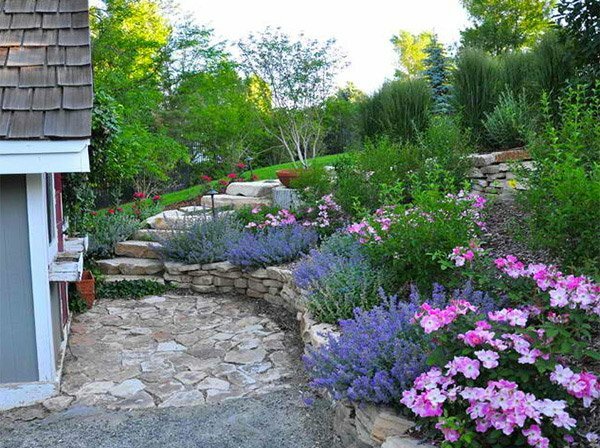 The entrance to the home is accentuated by masses of annual flowers that frame the bluestone steps. 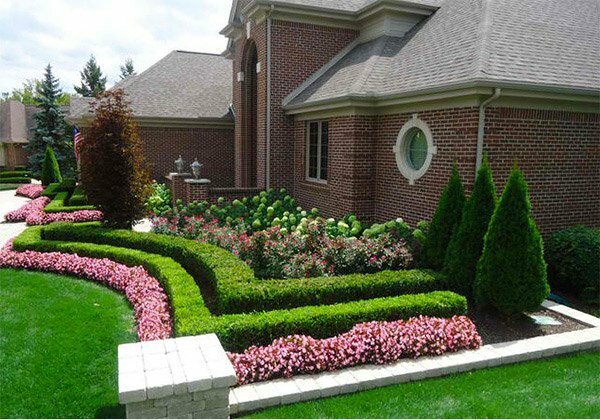 It is okay to use one color for your flower beds like this one. The dark purple is salvia while the lighter plant is Nepeta (Catmint). 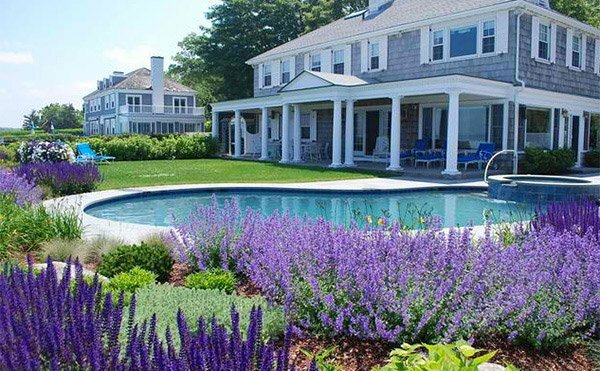 Both are perennials and they certainly add more life to this outdoor area! 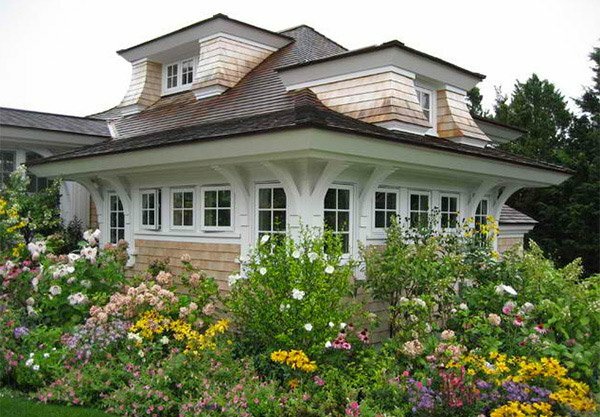 A classic New England home is surrounded by different flower types, colors and heights. A close-up view of hedgerows, flowers, and a brick retaining wall. The pink flower in front of box woods are Begonias. The pink flowers are very lovely in this tropical pool area. Nearly Wild Roses with Walkers Low beautify this landscape of stones. An elegantly landscaped estate designed with long, meandering bluestone paths that interconnect to formal garden spaces with natural woodlands. 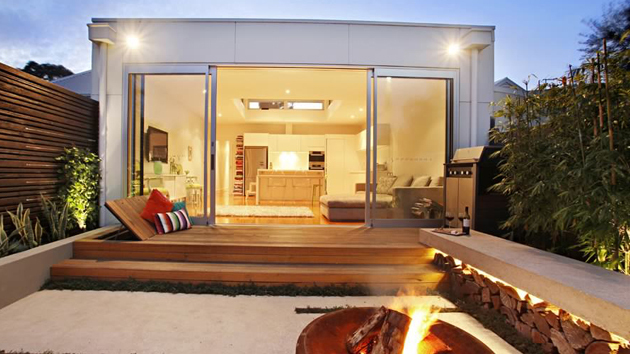 Plants and flowers of various types complete the look of this garden. 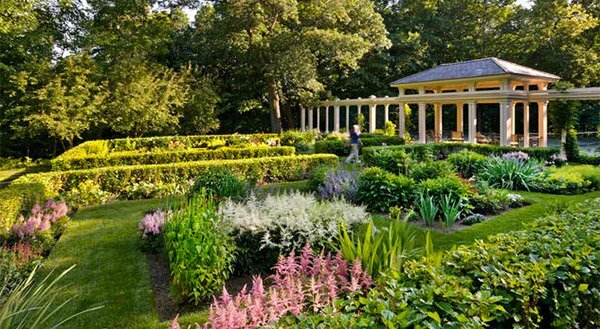 Rich and detailed garden with flower beds and raised beds containing the same flowers creating a coherent look to the garden. 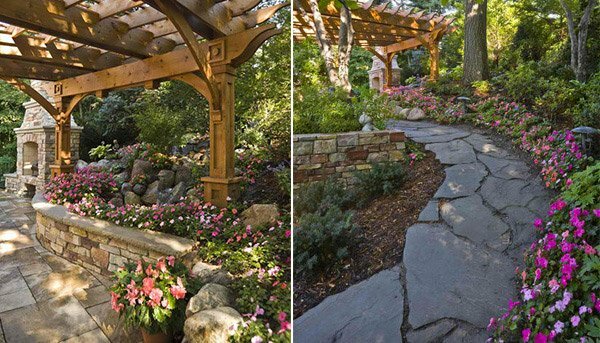 Brick and stone combined added more beauty to this landscaping with flower beds of pink and violet flowers. Well, we can never doubt how flowers can beautify our gardens just like what you have seen in the above list. Do you have flowers in your yard? If not, it might be time to put some! But make sure that you consider the kind of weather you have and the type of plants that grow in your area. And always take care of them because flowers and plants need some love! 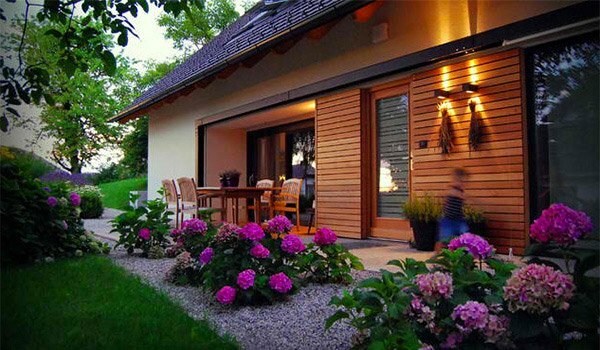 You can also try landscaping with trees and combine them with the flowers.